The US Drug Enforcement Administration has warned of the growing prevalence of the illicitly produced opioid painkiller fentanyl in counterfeit drugs. In a new report detailing the threats posed to the US by domestic and international drug trafficking and abuse of illicit drugs, the DEA notes the rise in the abuse of illicitly produced fentanyl and its contribution to the opioid epidemic in the US, which claimed more than 64,000 lives last year. Fentanyl is a schedule II prescription opioid approved for use in severe pain and is 50 to 100 times more potent than morphine. Of the more than 64,000 opioid overdose deaths last year, 20,145 were attributed to fentanyl and synthetic opioids, more than double the number of deaths attributed to these drugs in 2015. According to the report, pharmaceutical fentanyl is diverted from healthcare facilities but only on a small scale, while the bulk of fentanyl on the street is being illicitly produced, largely manufactured in China and Mexico before being smuggled into the United States, often posted through the mail. “The relatively small-scale quantities of licit fentanyl being diverted compared to kilogram seizures of illicitly produced fentanyl, indicates illicitly produced fentanyl is responsible for the current fentanyl epidemic in the United States,” the report states. The illicitly produced fentanyl tends to be distributed in powder form so it can be mixed with heroin or pressed into counterfeit opioid prescription pills, in both cases often without the user realising, the report says. There are also increasing cases of fentanyl being packaged and sold as heroin, with no heroin present in the product. The largest haul to date has been the seizure of 40kg of fentanyl powder in March 2016, discovered in hidden compartments of a pickup truck in the US state of Georgia. Seizures of fentanyl increased 72% between 2015 and 2016, the report says. 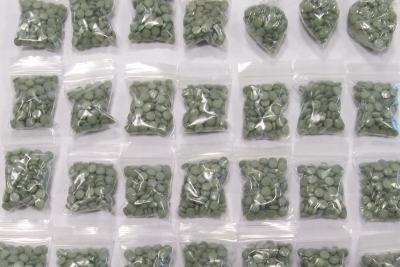 In many cases, US traffickers are purchasing pill presses from China to create counterfeit pills. The DEA has found foreign pill press vendors mislabelling the equipment or sending it disassembled to avoid law enforcement detection during importation. The report warns that the expansion of counterfeit pills containing fentanyl “threatens to circumvent efforts by law enforcement and public health officials to reduce the abuse of opioid medications; the arrival of large amounts of counterfeit prescription drugs containing fentanyl on the market replaces opioid medications taken off of the street”. This has already been seen in counterfeit anti-anxiety meds – fake Xanax pills laced with fentanyl killed nine people in Pinellas County, Florida between January and March 2016. “The high profitability of counterfeit prescription pills laced with fentanyl strongly incentivizes traffickers to continue producing them. These pills often retail for between $10 and $20 in illicit street markets, potentially netting traffickers millions of dollars in profit,” the report adds. However, the report notes that new regulations in China in March scheduling fentanyl and other synthetic opioids as controlled substances is hoped to have a dampening effect in the US. “China’s October 2015 scheduling of 116 synthetic substances resulted in a decrease of their availability in the United States, and additional scheduling is expected to yield similar results,” the report says.